Loose Muse is a monthly event set up and run by Agnes Meadows since 2005. It is London’s only regular event for women writers of all genres. It takes place on the second Wednesday of each month (except August when there is no event), at the Poetry Café, 22 Betterton Street, London WC2 (nearest tube is Covent Garden). Each event starts at 8.00 p.m. and finishes around 10.00 p.m. Entry is £5.00 or £3.00 concessions. The format is very straightforward. The evening is split in two halves, and features two women writers/artists every month drawn from all genres, so not only poets. Each gets 15-20 minutes to read from, and/or talk about her work, followed by a 10 minute Q & A session where the audience can ask questions and learn more about the writer and her work. Each half also begins with an open mic session with readers from the floor sharing their work. This means that new or less confident writers can read alongside those who already have an established reputation so that ideas and thoughts can be shared. The evening has built a solid reputation not only for the quality of work, but also for its welcoming and supportive atmosphere. 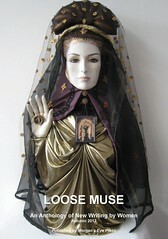 Loose Muse began in September 2005 and has been growing in popularity ever since. When the Poetry Café was looking for someone to run a women-focused event several of my poet pals said I should go for it. So many of the poetry nights I was going to seemed to be a bit testosterone fuelled, and I wanted to run an event that gave women writers a chance to get together, share their skills and experiences, and learn from each other. I also wanted the event the event to embrace all genres. This is why it’s open to all women who write anything at all – poetry, novels, plays, newspaper/magazine articles, flash fiction, editing, songwriting/lyrics, short stories, blogging etc. This has proved the right approach, and we’ve had an amazing array of featured writers. They have been drawn from a local, national and international pool, and have included literary stars such as poets Aoife Mannix and Malika Booker, Editor of Sable Magazine Kadijah George-Sesay, novelist Adrienne Dines, and broadcaster/singer Jumoke Fashola. Some are newcomers while others are well-established and well-known. A good number of writers Loose Muse has featured have gone on to bigger and better things – for example Sally Blackmore has been chosen as an Olympic Storyteller, Katrina Naomi was the Bronte Parsonage Museum’s first writer-in-residence, and Izzy White rediscovered her love of poetry at Loose Muse and is now a regular on the Performance Poetry circuit. Each event has two features who read their work and talk about it in a Q & A session. There’s also an open mic section where readers from the floor can share their work. This is Loose Muse’s seventh year and with the Arts Council of England grant, we can open the events up and increase their reach. We can now commission four new pieces of work a year and put together two anthologies a year with submissions open to any woman writer who has attended a Loose Muse event. – Agnes Meadows Loose Muse Founder, Host and fellow writer.